3 pickup pole screws had to be adjusted upward in the pickup to balance the volumes of the pickups and pole pieces fore and aft and lateraly. The screws threads were loose so I tightened them up with water-thinned Elmers apllied with a fine artists brush, to hold the screws at their height settings in the pickup. 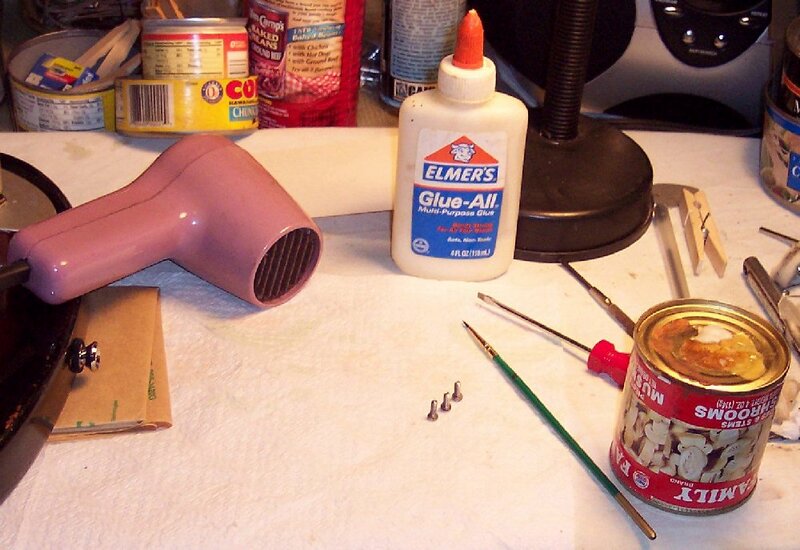 The type of glue was dried with a small hair dryer. 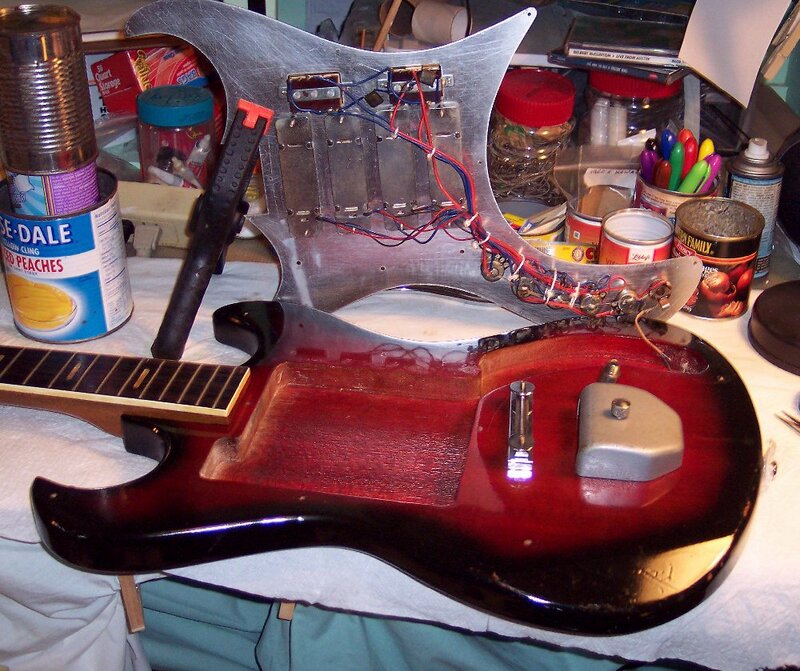 This glue does not interfere with the screws normal adjusting action nor is it harmful in any way to the pickup. 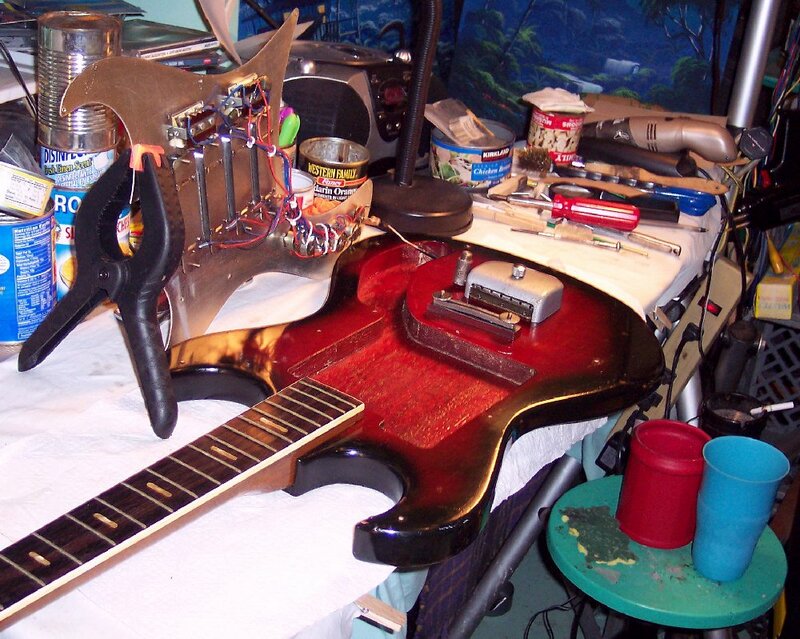 Inside of both cutaways were hand-compouned and polished to match guitar's finish after removal / repair of extra left-handed strap button, and the correct strap button's hole, and the paint rap into the neck pocket's front lips. 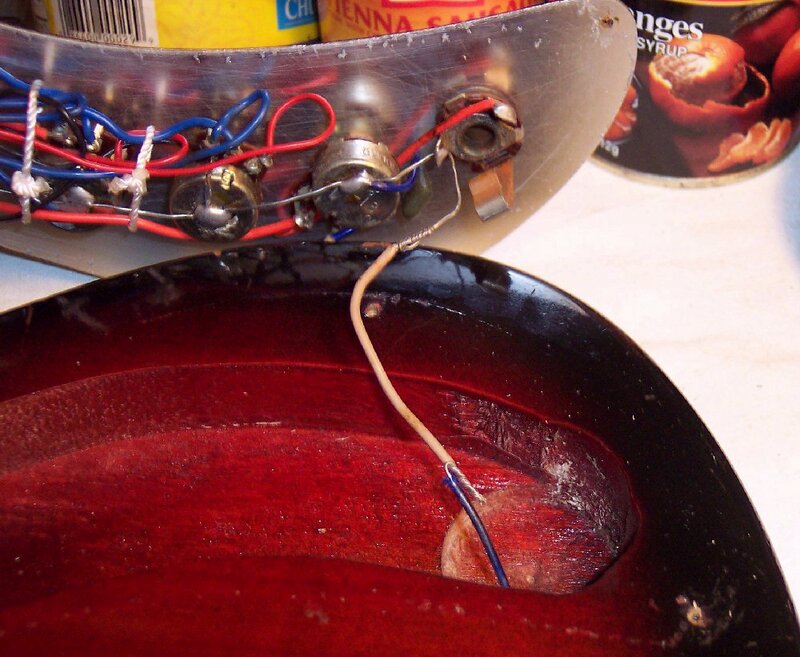 The black spring clamp and it's "legs" holds the pickguard electronic plate vertical while hooking it's strings ground wire to vibrato ground lead. 2 or more of these clamps also work great to hold a guitar in a vertical position on it's side, ...but be sure to pad the clamp(s) so they don't scar anything. These clamps are very affordable and come in sets of different sizes from this large size right down to tiny clamps; Great clamps to have around a shop. Someone in the past wisely put a jumper wire inline with the strings ground wire to the vibrato; So that the electronics can be leaned out free to inspect and easy to remove if neccessary. I re-hand-twisted the wire connections, clipped them even and sealed with electrical tape. The yellow arrows show where I tied the ground down so it would not short against adjacent signal hot lines, particularly against the guitar cord plug or contacts. Only the center section of the screws' threads were coated with the glue. The tip threads are left original so they will easily start in their holes before reaching the glue which acts like teflon tape filler / friction on the threads. In a spot noted below, about the size of a U.S. Quarter or a Euro; The original clear coat long ago lifted from the guitar and is quite visible UNTIL oil polished. The oil fills in the transluscent layers and flakes of the old clear finish, ....and even then a person would have to know it's there to recognize it under a magnifying glass. The compounding and polishing in the cutaway horns and their transistion to the original finish, ...was done to a slight satin sheen. 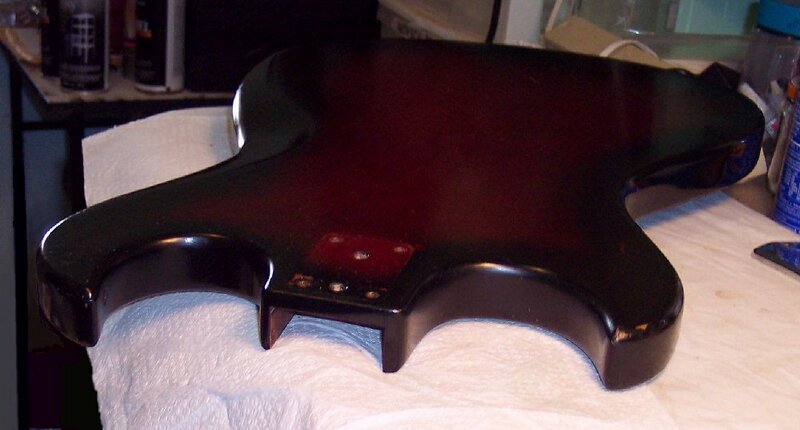 The oil polish makes the work area shiny along with the rest of the oiled guitar. 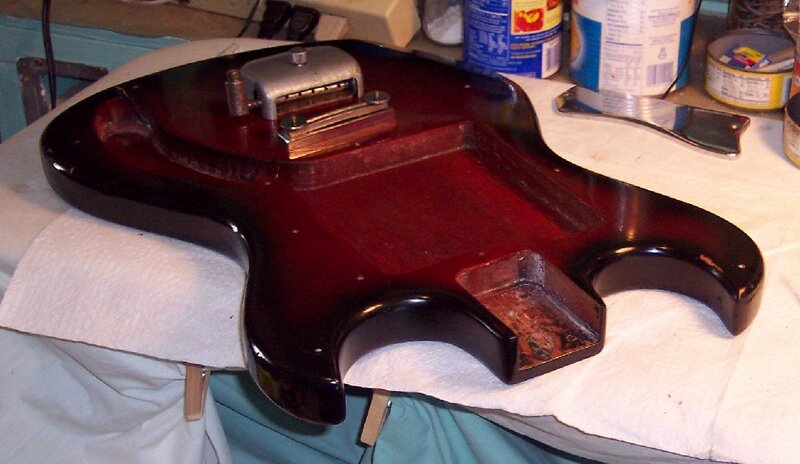 The slightly satin sheen best matches the guitar's existing original finish's overall sheen. If the oiled shiny look is not desired, then the slightly satin sheen can be further polished to a more shiny surface with about 5 hours of hand rubbing with polishing compound (water-thinned toothpaste works great), although great care must be paid attention to when such polishing might start removing paint down to bare wood in spots. 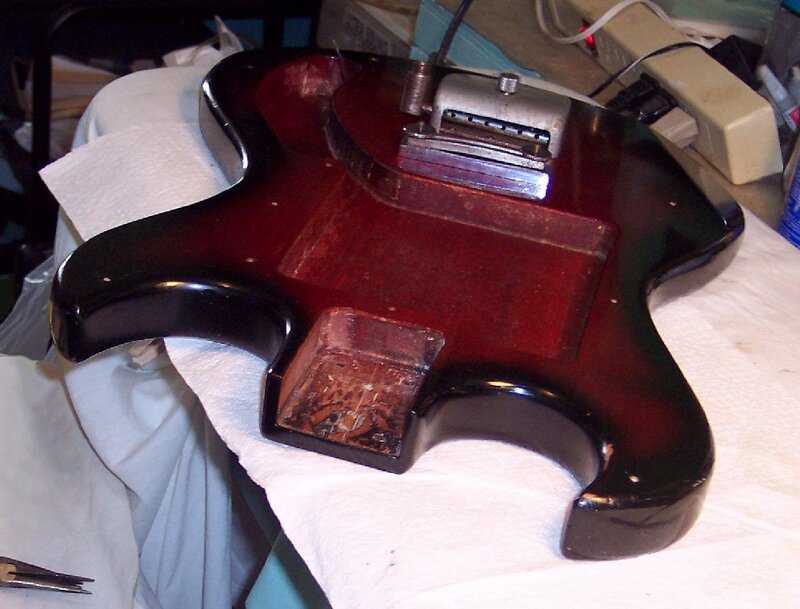 Notice again the offset of the bridge plate with only the bass-side screw installed, ...slanting the bridge forward on the treble side to provide the best achieveable intonation compensation the guitar did not have from the factory's perpendicular aligned bridge & saddle. This is a 3M scrub pad on a sponge. The sponge backing is not neccessary and I usually use a spent 3M pad without the sponge backing: This great trick is to use 3M scrub pads on dishes and other jobs until they are too soft to be used as a scrub pad. Then they are soft and just right for medium-grit compounding using an innocuous oil such as Ace Lube-E (or even the slightly salty / acidic oil wiped from your forehead with the pad !) to keep it slightly damp / lubricated to prevent tiny scratch marks. You can use a rubbing compound too, but remember that the 3M pad will greatly accelerate the compound's cutting. If I need one and only have a new one, I will go scrub down some rough concrete until the 3M pad becomes soft and ragged. You can also put a new one in a sock with several stones and throw it into the clothes washing machine a time or two until it beats up the pad to your desired softness.